Floromox (moxifloxacin) is a fourth-generation fluoroquinolone approved for ophthalmic use as Moxifloxacin ophthalmic solution 0.5%(w/v). Moxifloxacin is used to treat conjunctival infections caused by susceptible bacteria and to prevent infection following eye surgeries such as LASIK. 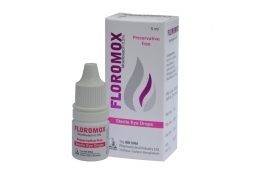 Floromox is available as 5ml sterile eye drops.